They use specific beads: Miyuki Delica seed beads, which are uniform in shape and size, they come in all kinds of colors. What I like about this DYI is that they used collored embroidery thread instead of (boring) colorless elastic or fishing line as I have used so many times. In the example, they spell out ‘I love you’ in morse code. I like this idea a lot, but unfortunately, like many of us, I don’t understand morse code. Therefor, I would just make any combination of colors with these beautiful beads. 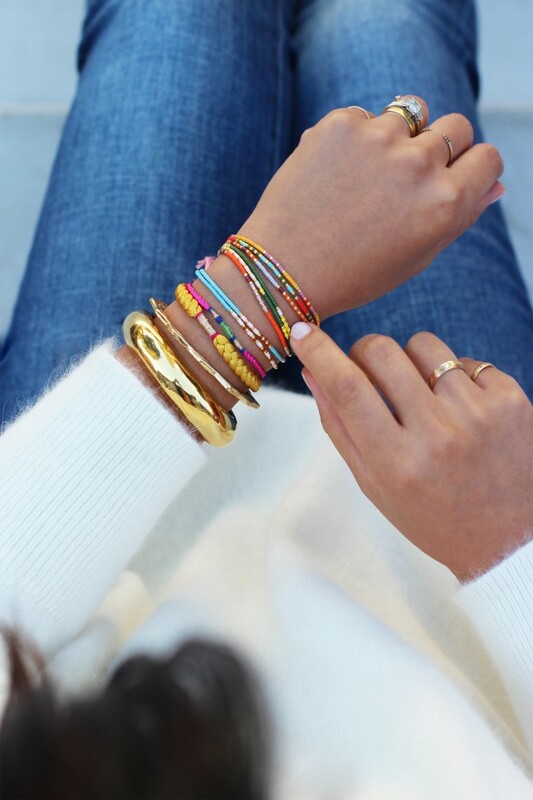 Stack ’em until you can’t stack ’em any more for a boho/hippie look! Look at the pictures below. Want to try it yourself? See the full DIY at HonestlyWTF.com! Thanks! I will add an update by email button.